Civilians in Aziziya, southwest of Tripoli, are reported to have fled their homes today as random shelling resumed in the area this morning. On Wednesday night rocket attacks are said to have resulted in the death of a child with one other person wounded. Several buildings are also said to have been damaged. In response, there were demonstrations today in Aziziya and the surrounding district, with protestors blaming the Presidency Council (PC) for the attacks. Angry Wirshefana elders have also said that the area would be vigorously defended. 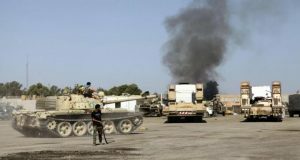 The fighting started yesterday when a joint force consisting of members of the Special Operations Force, led by Major Imad Trabulsi and ostensibly linked to the Libyan National Army (LNA), and a unit under Osama Juwaili, the PC’s western region military commander, launched an attack on the 4th Brigade camp in Aziziya. Consisting of local militiamen, the brigade is led by Omar Tantoush, head of the Wirshefana Military Council. The 26th Brigade camp and the Aziziya Training Centre are also reported to have been attacked. Trabulsi has accused the 4th Brigade of harbouring members of the pro-Qaddafi Popular Front for the Liberation of Libya as well as rebels from Darfur in Sudan. He had earlier ordered Tantoush to evacuate the camp and hand it over to him. He is also reported saying that the operation was additionally targeted at criminals in the Wirshefana area as well as ensuring the reopening of the road between Hosh Al-Seteen and Zahra bridge on the Swani road. The accusation about supporting pro-Qaddafi elements refers to Mabrouk Ahnish who was arrested in the area over a fortnight ago along with a Dafuri militia leader and then handed over to the Special Deterrence (Rada) forces in Tripoli. His militia in the Brak Al-Shatti area subsequently cut of the water supply to the capital in a bid to force Rada to release him, but it has no succeeded and much of the city still remains without water. Tantoush was previously allied to the LNA and was appointed by its Tripoli Operations Room in 2015 to take control of all checkpoints on the coast road east of the city. However, he broke with the LNA a year ago and Khalifa Hafter replaced him with Trabulsi. There is mystery this evening, however, at who exactly ordered the attack. Trabulsi has been quoted saying that the joint operation had been authorised by Hafter. However, the LNA general command has said that it did “not issue any orders to any of its units in the Western region” to carry out any military action. The PC’s chief of staff, Major-General Abdulrahman Al-Tawil, has likewise denied ordering any military action in the area. Despite answering to rival military commanders, both Trabulsi and Juwaili are from Zintan and the operation has widened the growing rupture between it and its former Wirshefani allies, both of whom were regarded as the vanguard of LNA forces in the west. While Zintan Minitary Council is reported ordering Wirshefana locals to keep away from the action, Wirshefana elders and officials have accused Juwaili and Trabulsi of trying to subjugate the area ahead of a Zintani attempt to move back to Tripoli. Elders from Bani Walid have meanwhile been trying to mediate an end to the clashes.